Kenya Barris’ Black-ish is now in its third season, where it’s been racking up accolades for its incisive humor and multigenerational relevance—Tracee Ellis Ross recently picked up a Golden Globe for her portrayal of Johnson family matriarch Rainbow, and she, co-star Anthony Anderson (playing Bow’s husband, Dre), and the show itself were all Emmy nominees in 2016. Despite being a family series, Black-ish tackles plenty of weighty subject matter, including racism and cultural bias. But it does so with the perfect blend of comedy and frustration—you’re never going to get a lecture from Black-ish, but you will learn something. We realize it’s become alarmingly easy to fall behind on even some of our favorite shows, even with the aid of DVRs, streaming queues, and second screens. But Hulu recently stepped up on behalf of Black-ish fans and cord cutters everywhere, acquiring the exclusive rights for subscription video on demand. We’ve done our part by putting together a list of five episodes to help you find your way (back). Black-ish isn’t interested in exploring what blackness is like only today but also the history of that experience. No episode merges Black-ish’s comedic take on modern and historical blackness better than “Pops’ Pops’ Pops.” As youngest Johnson kids Jack (Miles Brown) and Diane (Marsai Martin) work on a family tree for school, they realize they can only go back so far before running into question marks. While their classmates can pinpoint their ancestry back to the Mayflower, the Johnson family doesn’t have the same luxury. So, they have to rely on Pops’ (Laurence Fishburne) over-the-top family folklore to fill in the blanks. “Pops’ Pops’ Pops” transports all of Black-ish’s characters to the Harlem Renaissance—even Dre’s office is given an old-timey makeover. Although Pops’ story becomes more and more outlandish, the episode’s focus on family keeps things grounded. Even cameos from Mary J. Blige and P. Diddy fit right into Black-ish’s fantastical take on black history. The second season premiere, “THE Word,” immediately dispelled any notions that the quality of the first season was a fluke. Black-ish came roaring back with its trademark edge and humor: beginning with Jack rapping Kanye West’s “Gold Digger” and eschewing the radio edit, thus plunging the episode into an intelligent and often funny conversation about the N-word. The reason why “THE Word” works so well—besides the utter adorableness of Jack—is because Black-ish commits to showing all sides of the debates. This commitment is a staple of Black-ish; often we see how Bow and Dre disagree on something, or Dre and Pops (and so on), and equal weight is given to each of their sides. “THE Word” reiterates this commitment by putting multiple opinions on the table: It tackles the N-word from nearly every perspective, from Bow’s shock and anger to the argument that it’s basically a birthright—Dre humorously compares it to Jewish children who get to go to Israel—to the idea that we’re reclaiming a negative word and turning it into a positive to even eldest daughter Zoey’s (Yara Shahidi) nonchalance at her white friends casually dropping N-bombs. But “THE Word” also showcases another important aspect of Black-ish by refusing to give the viewers a clear-cut take on what’s right or wrong. It provides us with a blueprint for conversation; we have to build an answer ourselves. Running gags and solid recurring characters are the embroidery of any good sitcom. Black-ish combined the two into a doozy of an adornment in season one’s “Martin Luther Skiing Day,” which introduced the smoldering hostility between Dre’s co-worker Charlie Telphy (Deon Cole) and Diane. He calls her “Girl Twin,” she addresses him by his full first name, and their nonsensical conflict gives Black-ish some of its biggest out-of-left-field laughs. Several of those come from “Charlie In Charge,” the season-two installment in which a misdial from a heavily medicated Dre puts Charlie in the position of supervising Junior (Marcus Scribner), Jack, and Diane’s days, nights, wrongs, and rights. Diane seethes while her brothers do some Nancy Meyers-inspired wing-manning (as they say, it’s… complicated) between Charlie and his old flame, Dominique (Amber Rose), but she demonstrates her true cunning by refraining from outright sabotaging the evening. “Charlie In Charge” is evidence that Black-ish’s spoils extend beyond the Johnsons—even if one of the Johnsons wouldn’t approve of Charlie being spoken of in such glowing terms. 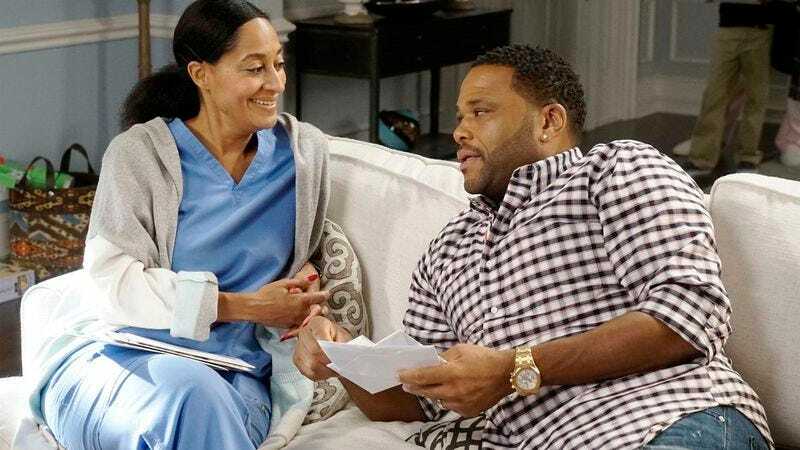 “The Johnson Show” isn’t where you turn if you’re looking for the most groundbreaking episode of Black-ish—for that, see “Hope” or “LEMONS” or “Pops’ Pops’ Pops”—but it crystallizes what makes this series so special in 21 perfect minutes. The formula: Take a plot designed to push Dre and Bow to their limits, throw in a big wrench, and lace it with the kind of honesty and relevance you don’t often find in sitcom-land. The plot in question is a simple one, with Bow and Dre both feeling the pressure to live the perfect life with their perfect family. In Dre’s case, he’s afraid that rumored layoffs at work will turn him into just another black guy without a job, while Bow throws an auction for the school but can’t ask for help, lest the other moms smell weakness. The wrench comes in the form of Jenifer Lewis’ Ruby, who convinces her grandkids that stealing gift cards is fine, since no one ever actually uses them. It’s a great, unsurprisingly funny plot, but what elevates “The Johnson Show” from solid to pretty much perfect is The Cosby Show. Episode writer Corey Nickerson uses Dre and Bow’s Huxtable aspirations to draw out questions about representation, double standards, and the need to be “three times as good.” If it sounds like subtle, thoughtful stuff, it is, but Black-ish has a gift for tackling big questions without straying into the territory of the very special episode. It might be relevant and timely, but when something’s this delicious, you sometimes might not notice that you’ve also eaten your vegetables. Black-ish often transcends its family sitcom format while remaining firmly rooted in the genre. Kenya Barris and his writers touch on many of the tropes we’re used to seeing in sitcoms, like the bumbling father who ends up doing more harm than good. But Black-ish is also revolutionary for having a far more equitable partnership at its core than most TV families. After all, there are now whole sitcoms of those guys getting their comeuppance for leaving the parenting to Mom. This late season two episode sees Dre thrust into the parenting spotlight—he must look after his flu-ridden children and his ailing mother and wife. Black-ish could easily milk the situation for all of its “BUT I WANT MOM” humor, which it does early on. (Bow is a mother and a doctor—who wouldn’t want her looking after them?) But even though I could watch a marathon of episodes of Ruby and Bow watching a Bette Midler marathon, it’s when “Daddy Dre-Care” shifts gears and shows off Dre’s own nurturing side—which is very much in his own style—that we get much more than laughs. Dre reaffirms to everyone (including himself) that he’s a great dad, and just in time, too, since this is the episode where Bow’s pregnancy is revealed.